I wan Jan was founded by the Taiwanese puppet master Li Tien-Lu in 1931, and in the intervening decades, it has become the most acclaimed puppet theater troupe in Taiwan. The name “I wan Jan” refers to the remarkably lifelike glove puppet. 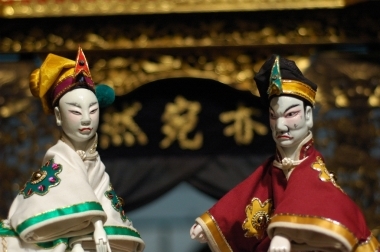 The original Taiwanese puppet theater can be traced back to China’s Fujian province in early 17th century. It was brought to Taiwan by Fujianese immigrants, gradually developing during the succeeding three centuries into the several forms practiced in Taiwan today. According to one of the troupe's members, performances of Taiwanese Puppet Theater are far more common in Taiwan nowadays than in mainland China, with troupes developing new, less traditional styles, including extremely popular made-for-TV puppet productions aimed at the younger market, chock-full of action sequences and special effects. Master Li died in 1998 and the story of Li Tien Lu and his traditional Taiwanese puppetry were the subject of a movie titled “The Puppetmaster”, directed by Hou Hsiao Hsien. The movie won the Grand Jury Prize at the 1993 Cannes Film Festival. Nowadays, the descendants of Master Li continue to run I Wan Jan, giving numerous performances in Taiwan and touring abroad every year.